blog.HalloweenAdventure.com | Latest News from the Costumes Trend FrontLines! 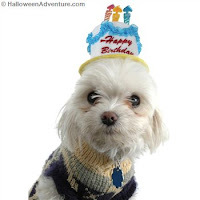 : Deck out your Pet! Got a pet that absolutely refuses to wear that adorable argyle sweater you got for him even when it’s 30 degrees outside? There’s no way you can wrestle him into a Halloween costume, but you so desperately want to dress him up! Well, thankfully, we have a few costumes that are relatively painless, so your pooch can be both comfortable and festive! 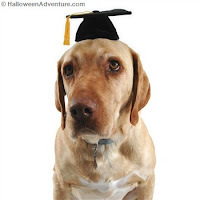 If you pooch refuses to wear anything at all, slip on our little Mini Graduation Hat. You can take him around to the neighbors and tell them he just graduated from puppy class (so what if he’s ten years old). Another easy option is our Mini Uncle Sam Hat. 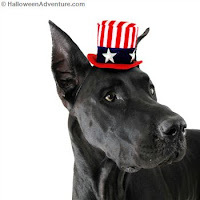 This is perfect for the patriotic pooches, with it’s American Flag design. It’s a surefire hit, as are our Mini Birthday Hat and Mini Elf Hat. If you think you can get away with it, stick the pup in our Dog Jester Collar. This adorable color is black and orange with little orange pumpkin bells that will jingle as he walks. Ah, un perro! Spanish pooches will look perfect in our Lil Bandito Pet Costume. 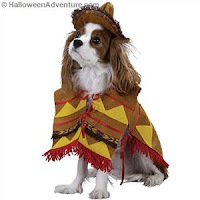 This Bandito pet costume includes a Tan Poncho with designs & fringe and a matching Sombrero Hat. Que pasa, hombre? Your little prince will love our Pup Royale Pet Costume. Made for kings, this costume features a red velvet cape with black and white trim as well as a matching oversized crown. Tres, tres chic! Lady pups will look dazzling in our 50’s Girl Pet Costume. This isn’t for the faint of pooch heart, as it’s a full out outfit, but for those that can take it, it’s absolutely adorable!